“This whole event came about with the feeling of impending doom that I was heading towards 50! 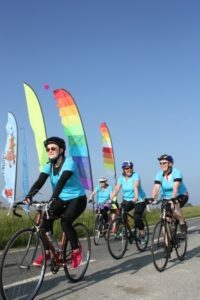 Then, one evening, over dinner with friends, I happened to say out loud how wonderful it would be to get 50 women to each cycle 50 miles and each raise £50 for charity. As the idea became more real, the thought of organising 50 women seemed a little too much of a challenge but the seed had been planted and the event was taking shape in my head. 50 miles (I had only cycled 19 at this point, some of the team had cycled even less) and £50 (got to be do-able surely? ), cheering and bunting at the end (I could organise that myself) and would it be asking too much to receive a medal? (As it turns out, no it wasn’t too much to ask and my husband surprised us all at the end). 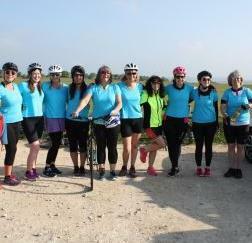 So, the ‘Fab and Still Nifty at Fifty Charity Cycle Ride’ was taking shape in reality. At our first planning meeting there was much ‘I’m not sure if I’ll be able to do the whole distance’ style conversations but I simply assured everyone that it was all about the joy and doing a little bit of good where we are. How much you did wasn’t the aim, taking part and making a little difference was (and on the day, every one of us cycled every mile). 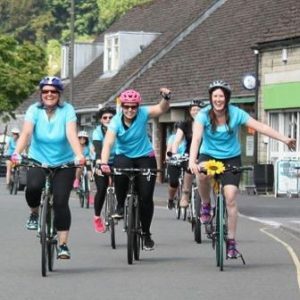 Unexpectedly, Pete, who was part of the original idea and had offered to be ‘anywhere we needed with scones and tea’, passed away suddenly at Christmas and his wonderful wife and daughters, who were already involved, took part with sunflower bedecked bikes in his honour. We chose to donate any money raised to charities that were important to us, for Pete’s family it was the Great Western Air Ambulance, for others it was Cancer Research, the RNLI and Action Against Hunger and for me, as a volunteer at The Door, my little bit of good (which far surpassed my £50 target at £450) was going to head their way. On the day, 29th May, we couldn’t have asked for more, the team of 10 wonderful women had put in the hours training – but our support team had taken the original idea and brought it to life with cheerleading, chalking on roads (it could have been the Tour de France) support vehicles, mechanics, picnic and cake stops, bell ringing and hooters – the joy was in our hearts (and around almost every corner). From Minchinhampton Reservoir, to Cherrington, Rodmarton, Tarlton, Kemble, Tetbury, Frampton on Severn, Standish, Stonehouse and Nailsworth – 51.9 miles as it turned out – our bright blue Nifty Fifty t-shirts could be spotted, the cheering and hooting as we turned the last corner was deafening and our smiles couldn’t have been wider. So if you are looking for inspiration take some from this – you can do it – whatever your seed of an idea is, water it and let it grow. This was an amazing experience because of the friendship, the support and the reasons we did it and there was joy – bucket -loads of the stuff!